Apple’s retail strategy is paying off for the company. As it continues to open new stores around the world, its share of the PC market grows. 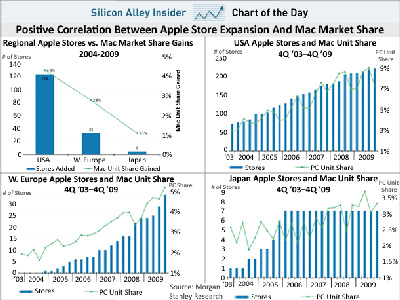 In a research report on Apple’s prospects at conquering the Chinese market, Morgan Stanley analyst Katy Huberty produced the charts below detailing the correlation between Apple’s market share and its retail expansion. Correlation and causation aren’t one in the same, as Philip Elmer DeWitt notes. The growing Mac sales could be due to other factors. Like, maybe people prefer them, as noted in the comments by our own Henry Blodget. 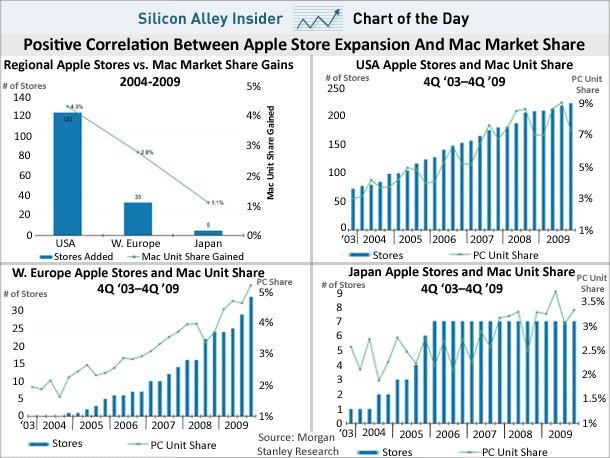 However, the charts below make a compelling case that Apple’s growing retail footprint is helping it sell more and more Macs.